Doncaster Rovers' Matty Blair (right) and Blackburn Rovers' Derrick Williams during the Sky Bet League One match at the Keepmoat Stadium, Doncaster. Pic: Simon Cooper/PA Wire. Doncaster Rovers produced a determined defensive display but were unable to rain on Blackburn Rovers’ promotion parade at the Keepmoat Stadium. Charlie Mulgrew’s 81st minute header proved to be the difference between the sides on a wet night in South Yorkshire and sealed the visitors’ instant return to the Championship. Darren Ferguson’s men defended admirably most of the night and showed no signs of winding down for the summer break. But they could have few complaints about the outcome as the Lancashire visitors enjoyed the better of the chances and simply wore Doncaster down. Backed by a vociferous following of almost 4,000 travelling fans, Blackburn started on the front foot and controlled the majority of the first half. They rather set the tone when live wire Adam Armstrong sent a superb slide-rule pass through for Danny Graham whose first touch took him past Marko Marosi but his shot from a tight angle drifted past the far post. The visitors had a real swagger about them. And they were within inches of taking the lead on 15 minutes when Armstrong’s volley was blocked on the line by Andy Butler and Marosi managed to pounce on the loose ball before Graham could get there. 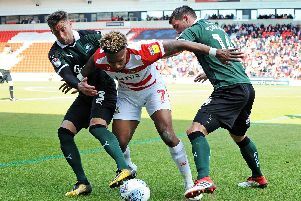 Doncaster deserve credit for steadying the ship but were unable to get going as an attacking force on their home turf. Marosi had to make a smart save to keep out Mulgrew’s free-kick which skipped off a sodden surface, before Craig Conway curled an effort just over the top. Alfie Beestin had tried his luck from distance earlier and just after the half hour mark he came very close to scoring against the run of play when David Raya had to be at full stretch to keep out his header from James Coppinger’s accurate cross. Blackburn were continuing to get in behind but the home side’s goal was leading something of a charmed life, especially when Armstrong’s volley was creeping in the far post until Bradley Dack diverted it inches wide. Doncaster’s best little spell was interrupted by the half time whistle, with Ben Whiteman bringing another full length save out of Raya with a low shot from the edge of the area. John Marquis had the ball in the net within 30 seconds of the re-start. But, much to the annoyance of Ferguson on the touchline, play was brought back for a foul and Whiteman curled the resultant free-kick just over. Blackburn continued to probe away. But the hosts were standing up to the challenge, with Butler and Mathieu Baudry impressing at the heart of the defence. Those two, in particular, made several timely interventions and threw their bodies in the way of the ball, although the whole team deserved praise for their levels of concentration and defensive discipline. When Mulgrew’s inswinging corner bounced off Niall Mason and went inches wide it looked like it just might be Doncaster’s lucky night. However, their fortune ran out and Blackburn’s persistence paid off on 81 minutes when Mulgrew rose highest to head Dack’s left-wing corner in off the underside of the bar. Mason sent a header straight at Raya from a corner but Blackburn used all their experience to see out time and the final whistle was the cue for a jubilant pitch invasion from the away end. Results elsewhere meant Doncaster are all but safe from the drop. They are six points clear of the bottom four and only a ridiculous swing in goal difference could now send Rovers down to League Two.